Between my arms I watched grass, ice and rocks fly by in an almost liquid blur. The speed was dizzying. I was told later that were going no more than a brisk trot, but it felt as if we were going much faster. I bounced on the animal’s neck. All of my attention was taken up in simply not falling to the ground. In the back of my mind, I was counting corpses. How many dead men? Inuji, of course. Then there were the two who tried to attack Mieko and the three out in the hallway. Another four or perhaps five in the courtyard. At least ten dead soldiers just at the inn, not including those who had died in the street—men whose wives and sweethearts and daughters would be waiting, waiting for a stomp of boots and a laugh that would never come. And for what? For nothing. The Imagawa soldiers were stung by their defeat at the hands of the Takeda, and decided to plunder their own village. But instead of easily cowed villagers, they’d had the bad luck to stumble into Lady Chiyome’s peculiar little army. I thought about Father, about watching him wrap his swords for the last time, putting them away and hugging you and me, then walking out the door, leaving us waiting. I began weeping onto the horse’s warm neck, my tears mixing with its sweat. And I slowly fell asleep. After some time, the sound of thunder seemed to dim slightly. Masugu’s stallion had slowed, as had those behind it. I lifted my head to see where we had come to. I looked up and was startled by the change in the landscape. The village where we had spent the night was in hills, well inland, and now, less than a late-autumn morning’s ride away, we were back on a long, flat coastline, not sandy and barren, this time, but rich, brown and green. A broad river, its surface pocked by sandy islets, poured quick and sleek into the ocean. Bright morning sunlight danced off of the river current. “It’s still morning?” I asked, squinting out to sea. A low dark smudge lay across the horizon. We came to the edge of the river, a few hundred paces from where the wide brown stream met the green sea. Our steed walked until its hooves had just entered the water, and then it stopped. Leather creaked as Lieutenant Masugu turned in his saddle. The wooden thud of hooves behind us slowly settled into silence, a silence as full as when our cat Ama had crouched in the sun outside a woodrat’s nest, waiting. Masugu seemed to be counting, making sure all of his soldiers had kept up. I twisted around, bending to see past the lieutenant’s armor. A few horses back I saw Emi, face frowning as always, but bright—whether with excitement or with fear I still couldn’t tell. Not far from her, Mieko sat, still lovely and seemingly at ease. The only sign that she had been riding at since day-break were a few strands of hair that had broken free and settled themselves elegantly around her cheek. 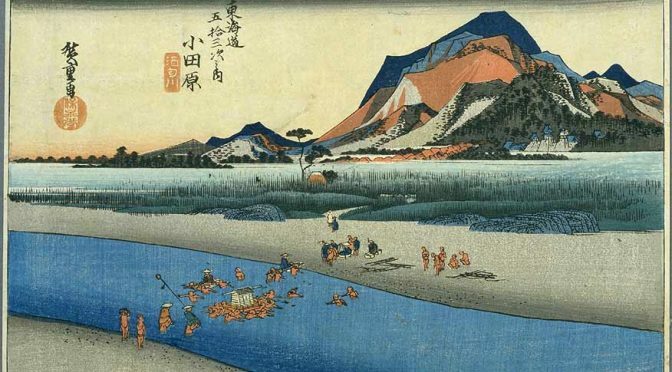 Far at the back, through a forest of horses, soldiers and spears, I could just make out Chiyome-sama’s palanquin, carried by the Little Brothers, their faces pink and spattered with mud, steam wisping up from their foreheads. “Forward!” called Masugu, his voice like a slap in the crisp, frigid air. And the entire company surged forward into the fast-moving stream. I must have gasped. I had visions of the quick flood sweeping us all out to sea. Even so, I was staring down at the water that swirled white around the horse’s knees and then its flanks as we moved slowly into deeper water. Confused, I looked up. His arm was pointing right past my ear. There, rising up distantly from a long range of low, fertile hills, was a tall cone like a perfect sand-mountain one of us might have made at the beach, only frosted to more than half-way from the top with snow. Mount Fuji. It was just like one of Oba-san’s sketches—perfect and symmetrical. “Fuji-yama,” I hissed, awestruck. As we rode, the lieutenant’s fingertip seemed to be bouncing on the summit. The horse was more than mid-stream, walking slowly and sure-footedly between the sandbars, utterly unconcerned with the water swirling beneath its stomach. “Do you know what the Takeda battle flag means? The four diamonds?” Masugu asked. I shook my head, still staring up at the camp, and at the mountain, so far beyond it. The stallion was carrying us up onto dry land, water streaming from its sides. Lieutenant Masugu encouraged it up the slope a little way and then wheeled around to survey his troops as they crossed. A light breeze was kicking up, swirling the river’s flow like a cat’s fur that’s been stroked the wrong way. Our horse’s legs shivered. Among the black-clad soldiers crossing the water, the few women and children dressed in blue stood out like forget-me-nots. The Little Brothers had found a square mat somewhere—perhaps on the packhorses—on which they had floated Lady Chiyome’s little box. I looked across the river at the now-empty shore. I realized that, for the first time since I was a baby, I was outside of Totomi. And it struck me as funny because I didn’t feel any different at all. I should have known. I should have felt it. Everything had changed. I simply didn’t know how much. Lieutenant Masugu galloped us into the camp in one last burst of speed—just for the joy of it, it seemed. We flew past sentries with long rifles, through a gate in a wall of logs and dirt, into the wind-swept compound of white tents and brightly colored banners: red, blue, and green, like Masugu’s troops. At the center of the camp, we stopped beside a circular, roofless enclosure of white panels that seemed to be made of silk. Two massive looking warriors stood, impassively watching, as we stormed up. Masugu leaped from the horse’s back and strode forward to speak to the guards. “Lieutenant Masugu reporting as ordered, with some unexpected guests for the General,” he said, sounding very pleased with himself. I became aware that I was alone on the stallion’s back. It began to whip its black muzzle back and forth, in part, I was sure, in order finally to fling me from its neck. The lieutenant must have seen my anxiety, because he walked back, patted the horse above its nose, and plucked me down, as if I were merely a baby. “Welcome back to earth, Murasaki-san,” he said. One of the soldiers led the lieutenant’s horse away, and within the time it would have taken you to count to twenty, the cavalry had disappeared, leaving only Lieutenant Masugu, and the members of Lady Chiyome’s little band. The lady herself stood, looking as immovable as ever beside her palanquin. The Little Brothers were soaked with sweat, and red with exertion, but to judge by their faces were as calm as always. One of the enormous guards stepped back out from the flap in the enclosure. “Lieutenant, the General is waiting for your report.” As Masugu bowed and walked through the opening, the guard left the panel unfastened. At the time I thought he was being lazy, but knowing Takeda soldiers as I do now, I am fairly certain that someone inside had wanted the panel open, in order to look at us. I could see a group of magnificently armored samurai sitting in a circle within. Mieko and Kuniko walked to either side of me, and I felt the rest of our party come up behind me. Lieutenant Masugu was talking to a bald man seated on a raised platform. They were both peering back out the opening toward us. The seated man gestured, and the two guards stood back, inviting us in. Lady Chiyome strode forward, and we followed her. As we walked in, the eyes of perhaps forty men—all hard-faced warriors—followed our progress. When we reached the platform, Lady Chiyome bowed low, and we all kneeled and touched our heads to the ground. “Chiyome, it is as always a pleasant surprise to come across you,” said the low, rough voice of the man before us. “Is it true that you have found some very special students for your school?” He gave the last word an emphasis that made me shiver. We were already prostrate, our heads dutifully pressed to the dusty straw tatami mats that had been thrown down on the dirt to create a floor. I shuffled across the straw on my knees, my gaze still down. "Look at me,” he said. I did, though it was the last thing I wanted. I was a little shocked by what I saw. Lord Takeda was smaller than I had expected. He was leaning on a small table—a writing desk—peering down at me. His face was a perfect oval, kindly, though his eyes were cold. He was almost completely bald—a dark stubble showed that he shaved, like the Little Brothers—but over his mouth he wore a thick mustache. "Mukashi, mukashi,” he said, "long, long ago, Kano Kazuo was a great samurai. Are you truly his daughter?” His eyes stabbed into me. "I hope so, my lord,” I said, looking back down at the mat, with no idea whatsoever why he might have asked a question like that. Takeda-sama gave a grunt and then a short laugh, and the circle of soldiers laughed too. "Go,” he ordered. I shuffled back to Emi and Toumi and put my forehead back to the mat. Out of the corner of my eye, I could see Toumi’s face, which was twisted in spite. We spent the night in the camp: three girls and three women among perhaps fifteen or twenty thousand men. The food was much better than at either of the inns, I had never felt so tired—or sore—in all of my life, and Mieko and Lieutenant Masugu seemed to be spending a lot of time not noticing each other. Toumi wouldn’t talk to me, but I had gotten used to that. In fact, I preferred it to the snide attacks that she usually aimed at me. The next morning, we woke to find the whole camp in movement. Tents were coming down, cannons were being prepared for transport, soldiers were packing up their gear, preparing to march. It felt like being inside a termite colony that had been prodded with a stick. The wind continued to whip down from the mountains, but it was not a freezing wind now; it smelled wet. Bugano came back from the stables leading the horses, along with Lieutenant Masugu and ten of his lancers. What do you think? None of this is essential for this book (and we’ll be meeting Takeda-sama in a future volume 😉 ), but I like the description of the ride and of meeting the Mountain. I like that the trip to Lady Chiyome’s “school” is quicker, but I miss some of this. Hey! 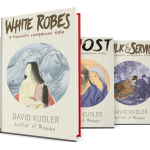 I’ve also posted a prequel story, “White Robes,” that features the meeting of Lady Chiyome, Mieko, and Kuniko! 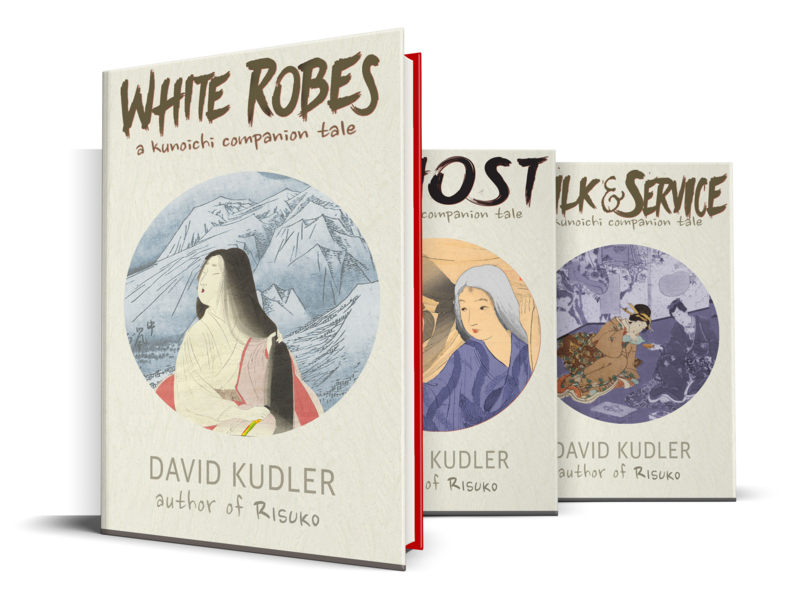 It’s the first in a series of what I’m calling Kunoichi Companion Tales — sign up now to read it! Interesting chapters! I may not be qualified for the prize – I feel like I’ve read the answer somewhere already – but I believe she’s telling all this to her sister. Please email me at [email protected] and let me know what email to send your well-deserved download code to!